Last month I wrote excitedly about my Edinburgh Yarn Festival jumper - Bright Above Me. After I posted, I sat down and knitted a few more rounds, and with each stitch I fell more and more out of love with the project. I found the combination of increases and long floats really tiring, so I wasn’t picking the project up enough to make any significant progress. There was also the small issue that while I can knit colourwork with a baby on my knee, this colourwork was just too complicated. So I unravelled it, with precisely no regrets. Once I had unravelled the star jumper, I looked through my Ravelry queue to choose something new to cast on. 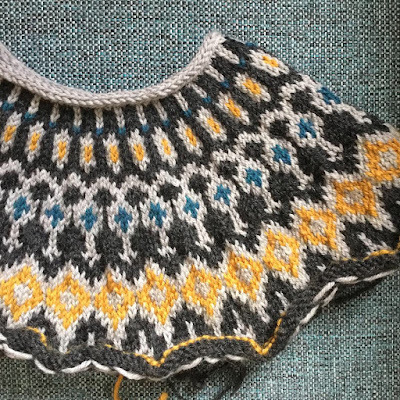 I knew I wanted to knit a colourwork sweater, ideally from the top-down (I have issues getting the length right when knitting from the bottom up). I had quite a lot of jumpers by Jennifer Steingass in my queue, but my favourite was Starfall, which has a beautiful colourwork yoke that makes me think of jewels. 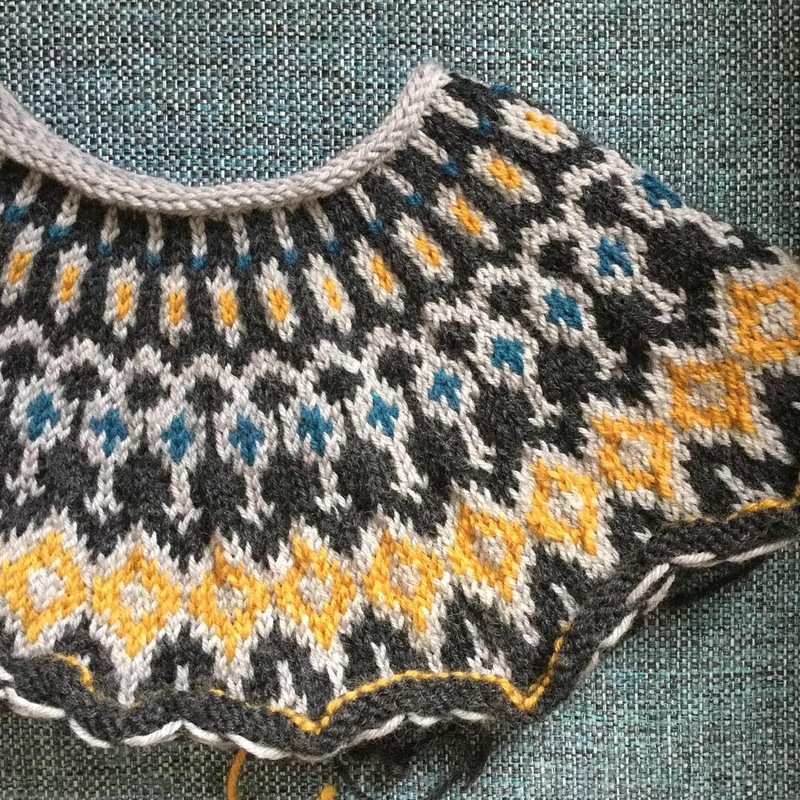 The pattern is written from the bottom-up, and I did briefly consider knitting the jumper as written, before having a revelation: I could cast on the yoke provisionally, then knit the whole yoke before picking up the held stitches and knitting the rest of the jumper from the top down. A bit of knitting later, I have a completed yoke. It is glorious! I enjoyed the colourwork so much more than the stars, even with the three-colour rounds (those rounds had to wait for uninterrupted knitting time - I couldn’t do them while feeding the baby). I’ve also realised that I much prefer working decreases when knitting colourwork than increases - if I’m working increases I find my floats end up a little tight. While I won’t be wearing my jumper at Edinburgh this weekend,* I hope to have the yoke back on the needles by then, ready to work the body and sleeves. If I’m really organised I might be on the body, ready for some mindless stocking stitch rounds on the train journey. I’ve dedicated more time than usual to reading this month. Partly for a rest, and partly because I’ve really enjoyed the book I’ve just finished: Everything I Know About Love by Dolly Alderton. This is a beautifully written autobiography, written by a self-confessed party girl, covering her years of partying, then her years recovering (she’s only 30 now), all within the framework of ‘love’. I don’t have a lot in common with Dolly (we’re both tall, and some aspects of her struggle with being seen as different as a child and teenager resonated), but I loved her writing style, and her depictions of non-romantic love were very emotive at times. Definitely worth a read. Linking up with Ginny for Yarn Along, a monthly crafting and reading link-up. *I’ll be there on Saturday. Say hello if you see me. It is good you frogged the jumper that you weren't enjoying so that you could start a new project you enjoy. The book sounds very interesting thank you for the recommendation! Lots of Socks KAL update!